Let’s start this off by saying this review shouldn’t really be in written form. Reviews like this are the only time I think about having a Youtube channel, because I cannot properly put into words how much I loved We Contain Multitudes. If I had a Youtube Channel, you’d be able to see my facial expressions and how squeaky my voice would get when talking about this book. But alas, I’ll have to interpret how I feel here. I’m not sure how I came across We Contain Multitudes. Perhaps it was mentioned on Twitter? Maybe I saw the words ‘fans of Jandy Nelson’ in a blurb on Goodreads. Wherever it was, I just knew I had to read this book yesterday. Jonathan Hopkirk and Adam “Kurl” Kurlansky are partnered in English class, writing letters to one another in a weekly pen pal assignment. This is only the beginning of the synopsis, but I needn’t read more. 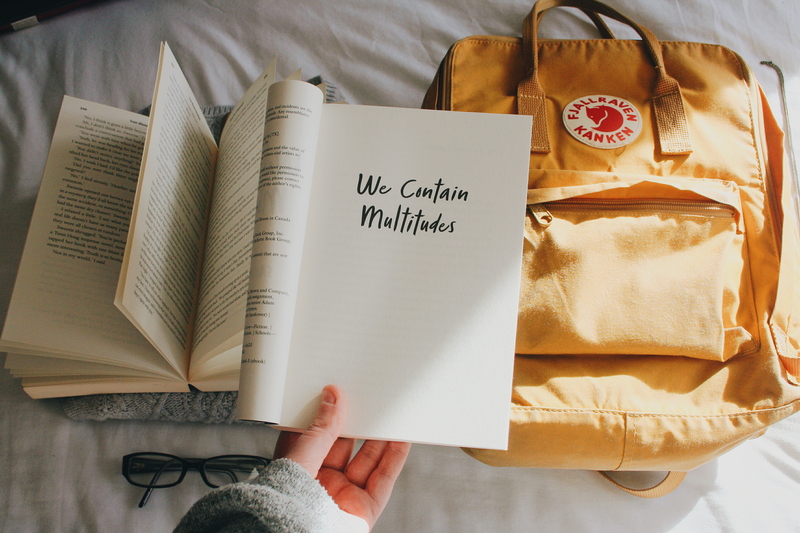 I’m already hooked and looking on #arcsfortrade, since I know We Contain Multitudes has no UK publishing rights at the moment. I manage to find a trade, it’s the first thing I read. And let me tell you, I wasn’t disappointed. I think it took me about a day and a half to finish the entire thing? And only because I was forced to think about other things for a bit, not because I wanted to book the down. While I may not always get on with letter form novels, the amount of emotion spilled onto the page wouldn’t be portrayed as nearly as raw without them. I felt like I was reading the very private letters of real people, learning so much about them just from some rambly, anecdotal retellings of past events. From what they wrote about, to how they wrote it, you could feel what they were feeling. Distance. Anger. Betrayal. Confidence. Lust. Love. Bully-turned-love interest is a popular trope with LGBT fiction. Just from the synopsis, I was a little worried about how this relationship would be portrayed. Bully-turned-love interest has it’s problems, and ‘a boy is picking on you because he has a crush on you’ is finally not being taught to young girls. So shouldn’t it be taught to young queer youth too? The bully isn’t always secretly gay. But that’s what I love about this book. Adam Kurlansky has the typical traits of a bully, but he never goes out to hurt Jonathan. In fact, from the first time we see Jonathan get bullied, Adam is there to defend him, using people’s perception of him as this scary older kid who likes to fight to his advantage to help Johnathon. Heartbreaking and real, this is perfect for fans of contemporaries with a lot of depth and meaning.